Yesterday, UK Chancellor George Osborne announced that his government was ready to begin rebuilding its foreign exchange reserves. Depending on when, how, (or even if) this program is implemented, it could have serious implications for the Pound. Forex reserve watchers (myself included) were excited by the updated US Treasury report on foreign holdings of US Treasury securities. As the Dollar is the world’s de-facto reserve currency and the US Treasury securities are the asset of choice, the report is basically a rough sketch of both the Dollar’s global popularity and the interventions of foreign Central Banks. Personally, I thought the biggest shocker was not that China’s Treasury holdings are $300 Billion greater than previously believed (with $3 Trillion in reserves, that’s really just a rounding error), but rather that the UK’s holdings declined by 50% in 2010, to a mere $260 Billion. Given that the Bank of England (BoE) injected more than $500 Billion into the UK money supply in 2010, I suppose that shouldn’t have been much of a revelation. After all, selling US Treasury Securities and using the proceeds to buy British Gilts (sovereign debt) and other financial instruments would enable the BoE to achieve its objective without having to resort to wholesale money printing. In addition, if not for this sleight of hand, UK inflation would probably be even higher. Still, this is little more than a mere accounting trick, and those funds will probably still need to be withdrawn from the money supply at some point anyway. Whether the BoE burns the proceeds or reinvests them back into foreign instruments is certainly worth pondering, but insofar as it won’t impact inflation, it is a matter of economic policy, and not monetary policy. As Chancellor Osborn indicated, the UK will probably send these funds back abroad. In addition to providing support for the Dollar (as well as another reason not to be nervous about the upcoming end of the Fed’s QE2), this would seriously weaken the Pound, at a time that it is already near a 30-year low on a trade-weighted basis. 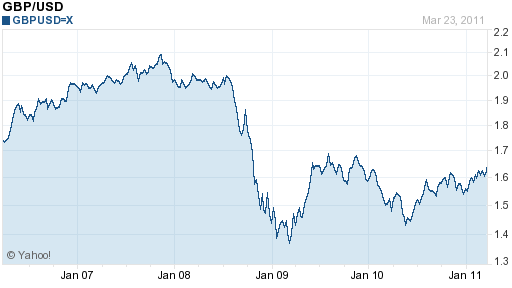 After falling off a cliff in 2009, the Pound recovered against the Dollar in 2010, largely due to the BoE’s shuffling of its foreign exchange reserves. To undo this would certainly risk sending the Pound back towards these depths. On the one hand, the UK is certainly conscious of this and would act accordingly, perhaps even delaying any foreign exchange reserve accumulation until the Pound strengthens. On the other hand, the BoE is under pressure to fight inflation. It is reluctant to raise interest rates because of the impact it would have on the fragile economic recovery. The same can be said for unwinding its asset purchases. However, if it offset this with purchases of US Treasury securities and other foreign currency assets, it could weaken the Pound and maintain some form of economic stimulus. Especially since the UK has run a sizable trade/current account deficit for as long as anyone can remember, the BoE has both the flexibility/justification it needs to coax the exchange rate down a little bit. Ultimately, we’ll need more information before we can determine how this will impact the Pound. Still, this is an indication that the GBP/USD might not have much more room to appreciate. « Pound Vs. Euro: Tie Game for Now?